Israeli soldiers abducted, on Monday at dawn, seven Palestinians from their homes in the northern West Bank governorates of Tulkarem and Jenin and confiscated several mobile phones and laptops. 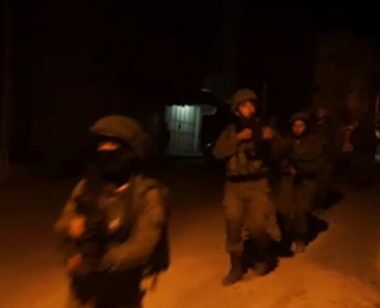 The Tulkarem office of the Palestinian Prisoners’ Society (PPS) said a large military force invaded Shweika area, north of the city, searched many homes and abducted Jihad Anan Edheilia, 28, and Khaled Raslan Edheilia, 38. Jihad’s father said dozens of soldiers surrounded their home, before storming it approximately at 3:30 at dawn, abducted his son, and confiscated his mobile phone. He added that the soldiers took his son to his store, where he sells mobile phones and electronic, violently searched the store and illegally confiscated several mobile phones and laptops. In related news, dozens of soldiers invaded Jenin city, in northern West Bank, and Qabatia town, south of Jenin, searched and ransacked many homes and abducted five Palestinians. The abducted Palestinians have been identified as Emad Abu al-Haija, from the Eastern Neighborhood in Jenin, in addition to Qoteiba Ahmad Shalabi, Bassem Tazaz’a, Rabea Fadel al-Basha and Ahmad Sa’id Abu ar-Rob. Local sources in Qabatia said the soldiers invaded many homes in the towns and searched them for several hours.